Oil on Board, 46x30cm. Adolphus Knell fl. 1860 - 1890 Adolphus Knell is believed to be one of the sons of the marine painter William Adolphus Knell (1818 - 1875). There were at least four well known marine painters in the Knell family including John Henry and William Calcott Knell. At different times they shared the same residential London address but their exact relationship is unclear. Adolphus Knell was first listed as a painter in Bath later moving to Bristol where he lived and painted for most of his life. He specialised in the busy waterways and harbours of Southern England. A large collection of his work is held in the Old Customs House, Lymington. Albert Chevalier Taylor R.A. 1862 - 1928 A superb example by the artist best known for his long association with the Newlyn School. He was born at Leytonstone in Essex and won a scholarship to the Slade School at the age of seventeen. He moved to Newlyn in 1884 at the very beginnings of the Newlyn School of Painting founded by Stanhope Forbes. He exhibited at the Royal Academy from 1887 and won a medal at the Paris Salon in 1891. 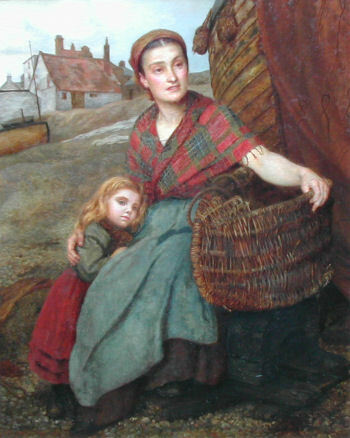 In 1895 he left Newlyn for London and became very successful eventually being elected a member of the Royal Academy. Watercolour, 47x41cm. Albert Moulton Foweraker R.B.A. 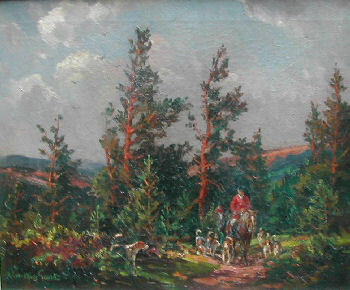 1873 - 1942 Provenance : Ex private collection. 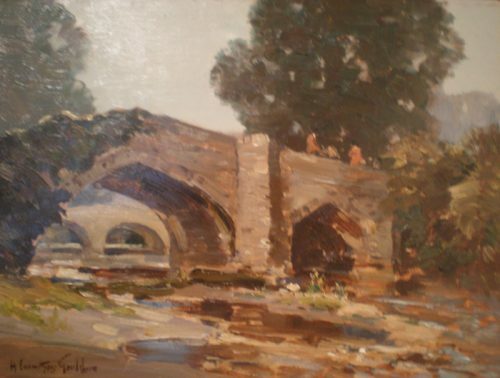 Born in Exeter, Moulto Foweraker began life as an engineer but in 1898 became a full time painter. 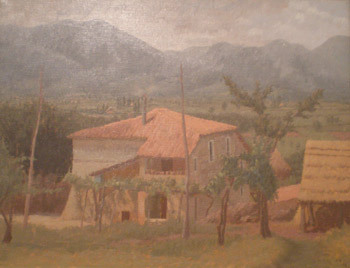 In 1902 he was elected a member of the Royal Society of British Artists. 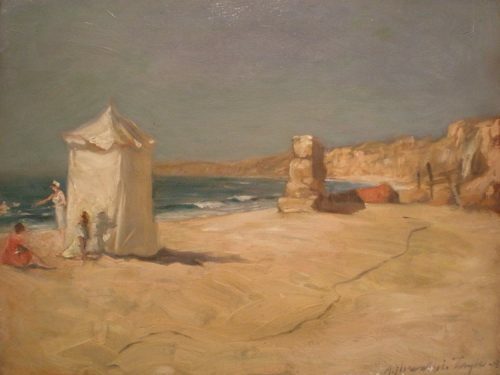 He was an exhibitor at principal London and provincial galleries during which time he traveled extensively in Spain, Southern France and North Africa. He produced many paintings on his travels although it is for his Devon and Cornish paintings that he is best known. Oil on Board, 11x17cm. Carruthers Gould R.B.A., R.W.A. 1870 - 1948 The son of the Victorian caricaturist Sir Francis Carruthers Gould lived for many years at Doverhay in Porlock. He first exhibited at the principal London Galleries from 1892 and was elected a member of both the R.B.A. and the R.W.A. He produced a good deal of work in both oil and water-colour of Exmoor and the surrounding countryside and has an enthusiastic following. Carruthers Gould R.B.A., R.W.A. 1870-1948 The son of the Victorian caricaturist Sir Francis Carruthers Gould lived for many years at Doverhay in Porlock. He first exhibited at the principal London Galleries from 1892 and was elected a member of both the R.B.A. and the R.W.A. He produced a good deal of work in both oil and water-colour of Exmoor and the surrounding countryside and has an enthusiastic following. Oil on Canvas, 90x64cmcm. Alexander C Koolman R.P., R.B.A. 1907-1998 Alex Koolman was a noted painter in oil and pastel of portraits and figures, often in interiors. 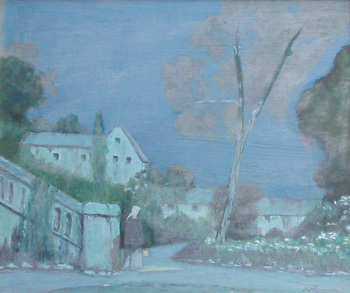 He exhibited regularly at the Royal Society of British Artists, being elected a member in 1948, and also with the Royal Society of Portrait Painters. An example of his work is held by Kirklees Muesums & Galleries. He lived in London for many years. Oil on Board, 74.5x64cm. Alexander C Koolman R.P., R.B.A. 1907-1998 Alex Koolman was a noted painter in oil and pastel of portraits and figures, often in interiors. He exhibited regularly at the Royal Society of British Artists, being elected a member in 1948, and also with the Royal Society of Portrait Painters. An example of his work is held by Kirklees Muesums & Galleries. He lived in London for many years. Oil on Board, 58x50cm. Alexander Jamieson R.O.I., I.S. 1873 - 1927 An important Scottish painter, he studied at the Haldane Academy in Glasgow where he won a scholarship to Paris in 1898. He was elected a member of the International Sculptors, Painters and Gravers and a member of the Royal Institute of Oil Painters. His first one-man show was held at the Carfax Gallery in 1912. His work is represented in a number of important public collections. Watercolour, 73x62cm. Alexander Kellock Brown R.S.A., R.S.W., R.I. 1849-1923 Kellock Brown was born in Edinburgh studying first at the Glasgow School of Art and later attending Heatherley's in London. His first Royal Academy painting was exhibited in 1872 and he became a regular exhibitor both in London and in the principal Scottish galleries from this date. He was to spend much of his life in Glasgow and remains a painter in the true Scottish watercolour tradition. Additional details on request. Oil on Board, 34x27cm. Algernon Mayow Talmage R.A., R.O.I., R.W.A., A.R.E. 1871-1939 Talmage studied at the Herkomer School and in St. Ives, staying on in the town to assist Julius Olsson at his painting school. He went on to exhibit internationally, winning medals in America and in Paris and he was elected a full Royal Academician in 1929. Like many of his St. Ives colleagues he favoured moonlit subjects painted in a restrained impressionist manner intending to convey atmosphere and mood. Oil on Board, 57x47cm. Algernon Mayow Talmage R.A., R.O.I., R.W.A., A.R.E. 1871-1939 Talmage studied at the Herkomer School and in St. Ives, staying on in the town to assist Julius Olsson at his painting school. He went on to exhibit internationally, winning medals in America and in Paris and he was elected a full Royal Academician in 1929. Like many of his St. Ives colleagues he favoured moonlit subjects painted in a restrained impressionist manner intending to convey atmosphere and mood. Oil on Canvas, 68x79cm. Donkin exh. 1880 - 1909 Signed with a monogram and dated 1882. 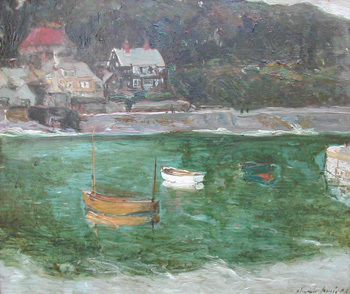 A stunning example of 'Staithes School' painting, painted before the formation of the Newlyn School in Cornwall. 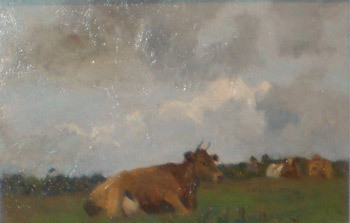 This type of subject matter has become very rare, painted at a time when this type of subject matter was in the main romanticised in the typical manner. Little is known of the early life of Alice Donkin although she is recorded as living at various times in Berkshire and London. She obviously had considerable success during her lifetime as she exhibited at numerous important leading London galleries exhibiting with the Dudley Gallery, London Salon, Royal Society of British Artists, Royal Institute of Oil Painters, Society of Women Artists, Royal Academy etc. Oil on Canvas, 57x50cm. 1902 - 1990 Alice Khon was a student of Madeleine Planty. She later studied at the L'Ecole des Beaux Arts de Lyon. At about this period she befriended Rene Dumas, Pierre Pelloux, Antoine Chartres and Henri Vielly. These artists exhibited together as 'Les Nouveaux'. In 1936 Khon met Pierre Bonnard and Foujita. She became friends with the artist Salvado who was Picasso's model for the painting 'L'Arlequin' Khon also modelled for Picasso. 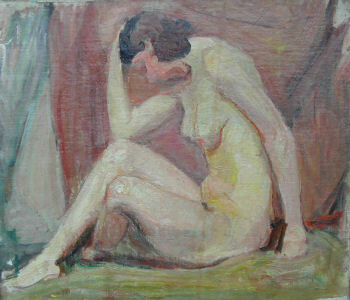 In 1941 she exhibited at 'Galerie Roger' in Lyon. In 1941 Khon became a member of the French Resistance during World War II changing her name to Marie Claude and became the secretary for the Regional State Major of Combat. Oil on Canvas, 16x19cm. Newton Sutherland exh. 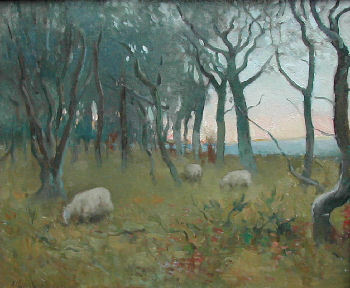 1908 - 1915 A painting in the true Scottish tradition and wonderfully atmospheric. 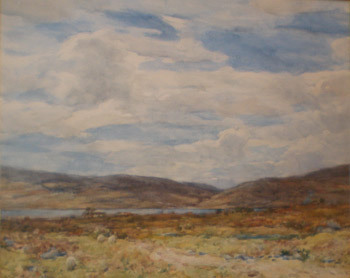 Allan Sutherland lived in Glasgow and exhibited at the Royal Scottish Academy, Glasgow Institute and the Royal Scottish Society of Painters in Water-Colours. With a talented artist such as Sutherland it is interesting that he ceased to exhibit after 1915 but this was in fact very common as World War I claimed the lives of many promising painters. Oil on Canvas, 55x45cm. Hornby N.E.A.C. 1914-1996 Anna Hornby was born on the 6th of April 1914 and was educated at the independent Westonbirt School, Gloucestershire. 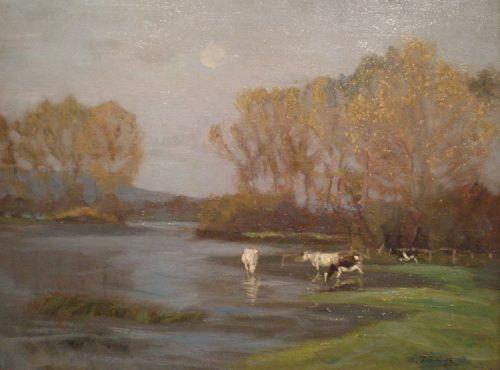 She went on to study art in Florence with landscape and flower painter Aubrey Waterfield in 1934, and later that year enrolled at the Byam Shaw School of Art in London where she studied under Francis Ernest Jackson, graduating in 1940. Apart from painting, calligraphy was Anna's other great passion - in 1952 she was appointed Honorary Secretary of the Society for Italic Handwriting, a post she held until 1962. 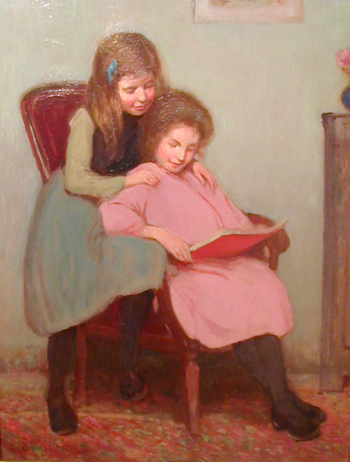 Through her interest in calligraphy and her association with the Society, she became acquainted with Alfred John Fairbank, whose portrait Anna painted (exhibited at the Royal Academy in 1961). 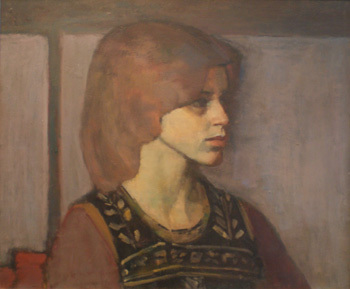 Anna was also a member of the Art Works' Guild and was elected a member of the New English Art Club in 1971. 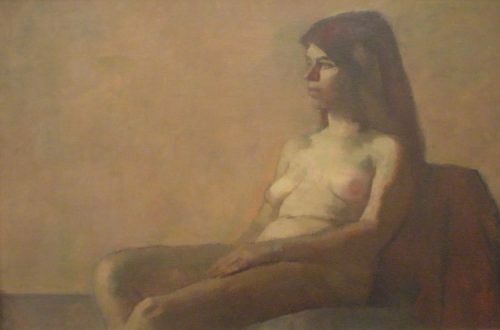 She exhibited widely with no fewer than 13 pictures at the Royal Academy, additionally she exhibited at the Royal Society of Painters in Watercolours, The Royal Society of Portrait Painters and the Royal Society of British Artists. Anna Hornby died in 1996, bequeathing paintings by Peter Greenham and Francis Ernest Jackson to the Ashmolean Museum of Art, Oxford. Many of her papers and letters, including correspondence with Alfred John Fairbank are held in the national archives of the Bodleian Library, University of Oxford and the National Art Library, London.